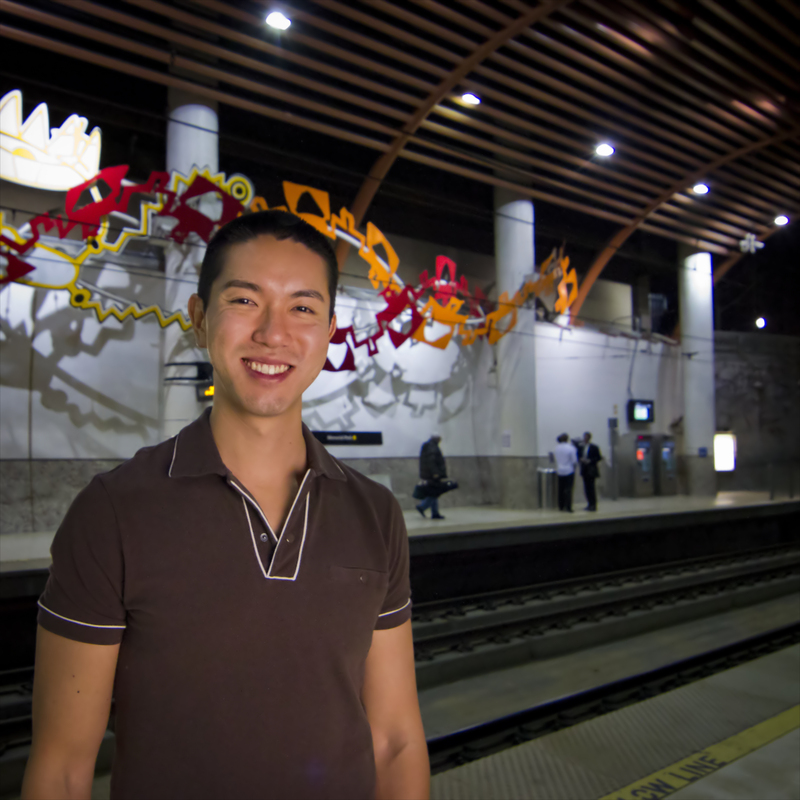 Brigham Yen at the Metro Gold Line Memorial Park Station. Photo by Fred Camino/Metro. Where we choose to live plays a giant role in our transportation choices. That’s why I was so interested in talking to Brigham Yen, a guy who could very well be L.A.’s only transit oriented real estate agent. In addition to helping people find their dream homes, Brigham is an outspoken transit advocate. His blog BrighamYen.com (you can also follow him on Facebook) is more than just his real estate calling card, it’s a place to find the latest in Pasadena and downtown L.A. urban development news and a repository for Brigham’s musings and ideas on improving transit in L.A. It’s become a beloved community resource for Pasadena residents and would-be residents. While the entirety of L.A. is Brigham’s passion, his home turf is Pasadena. That’s why I agreed to hop on a Gold Line train to meet Brigham for a transit oriented tour of the Crown City and a chat about L.A.’s transit developments through the unique lens of a man who helps Angelenos choose where to live. The Source: Why the focus on Pasadena and downtown L.A.? Brigham Yen: I grew up in Monterey Park so I’ve been coming to Pasadena since I was very young. I’ve always had an affinity for the area. Right out of college I moved downtown and started working for the Downtown Business Improvement District – bringing businesses and residents into downtown L.A.
Pasadena and downtown L.A. are two of the oldest parts of L.A. county – they’re very walkable, there’s a lot of character, a lot of history and I think that’s what attracted me to them. The Source: Tell us about your interest in transit. Brigham Yen: Urbanism, walkability and transit are inextricably tied. You can’t seperate them. You’re always going to have people who need to get someplace faster than walking, but how do you do it without a car? You need transit. After traveling to other cities – New York, Chicago, Toronto, Montreal, London, Taipei – I discovered that there’s a feeling of freedom that comes with transit. In London I stayed next to the British Museum and the ability to leave my hotel and get everywhere by foot, bus or train – that was liberating. Not having to depend on an automobile for my existence is what I call freedom. The Source: How does your passion for transit, urbanism and walkability relate to what you do as a real estate agent? Brigham Yen: It comes in two forms. One is that I always like to encourage my buyers to consider transit. Of course, they hire me to fulfill their personal real estate goals, but as somebody who’s interested in promoting transit and urbanism in L.A., I like to plant a seed in their minds. I remind them that in other cities across the world, people often make the choice to live near transit. One of my clients ended up buying a condo in South Pasadena, literally a minute walk away from the Mission Gold Line Station. I still keep in touch with her and she said it was the best decision of her life. She now takes the train to downtown, the farmers market in Hollywood – everywhere she can. She said choosing to live near transit introduced her to an L.A. she didn’t know existed. The second part of it is that I always try to write about these urban principles on my blog so that if potential buyers are reading there’s a chance they might discover a different way of thinking about L.A. The fact is, I wasn’t always into urbanism. But once I started learning about it – about the freedom, energy and vitality it offers – I really started to embrace it. So on my blog I try to espouse those ideas. The Source: Do you find many clients coming to you with an explicit desire for living near transit? Or is it still something that’s not really a priority to buyers in L.A.? Brigham Yen: Unfortunately I don’t get as many people as I would like asking for transit as requirement. Those that are aware of it mostly see it as a perk, not a deal breaker. Most people still value things like having lots of space and a yard, so there’s still a cultural gap here. But I think there’s going to naturally be more buyers requesting good urbanism once L.A. reaches a certain level of urban maturity. For example, if downtown L.A. hits a critical mass of amenities and things to do – once it becomes more like San Francisco or other cities we traditionally think of as urban – then I think more people will be requesting that kind of thing. The Source: Certainly your clients must come to you with fears about traffic? Brigham Yen: Amazingly enough I have clients that work on the Westside but choose to live in Pasadena. Again, I think once L.A. hits a level of urban maturity people will start to take different factors into account when choosing where to live – things like proximity to transit will become more important. The Source: We’ve dubbed you L.A.’s transit oriented real estate agent, but are you really the only one out there selling homes and pitching transit? Brigham Yen: Generally speaking, most real estate agents aren’t really going to be interested in pitching transit until the infrastructure is there. Take the example of an agent in Washington D.C. She may be used to including transit in her listings there because it sells. But if she moves to L.A. she probably won’t include transit info in her listings because, like I said before, it’s just not a priority for buyers here… yet. As Metro keeps expanding the system, real estate agents will naturally start to pitch transit in their listings. The Source: What are your personal thoughts about public transit in L.A. and where things are going? Brigham Yen: I think the system right now has good bones. I love the subway, I love the Gold Line. I use those a lot. I’m really excited for the Expo Line. I can’t wait to take the trains to Expo Park and the Natural History Museum. But just imagine how amazing it will be for USC students once the Expo Line opens. They’ll have a whole world to travel to, a world that they weren’t able to access previously. Suddenly they’ll be able to take the Expo Line to downtown, Hollywood, Koreatown, Universal Studios, Pasadena, Culver City. Their options for getting to places will be infinitely better than before the Expo Line. That’s the power of transit. The Source: As a Gold Line rider are you looking forward to the Regional Connector? Brigham Yen: Pasadena has six Gold Line stations, it’s a major transit hub. I think the ridership numbers are going to be amazing once the Regional Connector is built. I know people who work in downtown L.A. and live at the Del Mar Station in Pasadena but don’t take the train to work because they don’t want to make the transfer at Union Station. I think there’s probably thousands of people like them who would take the train into downtown if it wasn’t for that transfer point. Recently they have built Willow Walk in Compton, near Compton Station. It is a private town houses community, near the train station, near new shopping center and next to the MLK Transit Center (buses, Greyhound). They are beautiful and in a great location. I time this type of development should occur in Compton Station and Artesia Station (new homes near it would be awesome:next to jobs and CSUDH). I think it could become a prime location. It is near everything. Near freeways, near downtown LA (from the blue line:29mins) to downtown Long Beach (from the blue line:18mins. I have seen development all around the light rails and subways. I think it is awesome. Yen, in the near future will have more customers looking to buy near public transportation hubs. I know people are. Look at downtown LA. I know Brigham and he is right on with his concept and I’m glad he is such a strong advocate of mass transit. I moved to a great old apartment building in mid-Wilshire, the Talmadge, and one of the main selling points was it’s only 2 blocks from the Wilshire/Vermont Red/Purple Line station. I try not to drive at least 2 days a week and am on the Metro almost everyday. If I could get by without a car in L.A. I would. Keep up the good work Brigham.